S3 donated $5,000 to the Army Aviation Association of America (AAAA) during the 2018 Army Aviation Mission Solutions Summit Scholarship luncheon. 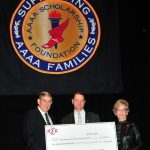 The AAAA Scholarship Foundation, Inc., is a non-profit, tax-exempt corporation established to render financial assistance for the college-level education of members of AAAA. The spouses, unmarried siblings, children and grandchildren of current and deceased AAAA members are also eligible. 100% of every dollar donated to the Scholarship Foundation goes to a scholarship or endowed principal. Since its inception, the Foundation has provided over $7M to more than 4,000 qualified applicants. The national scholarships are awarded on the basis of academic merit and personal achievement. S3 has been a longtime loyal supporter of the foundation.